This Pinarello was at a Giro related event in Valdobbiadene. If you can take your eyes off he pretty young lady for a moment note the retro style graphics. Anyone have any info on this Pinarello? Wilier Triestina USA has announced the special order availability of its reigning World Road Champion model, the Cento1, in a version modified specifically for use with Shimano’s acclaimed electronic drivetrain, Dura-Ace Di2. The Cento1 Di2 frameset boasts the same superlight 46Ton carbon monocoque construction and performance features, while enhancements have been implemented in the form of internal routing for wiring that connects the Di2 battery with its electronic shifters and derailleurs. "While performance was the key pursuit in the development and use of the Shimano Dura-Ace Di2 electrically actuated shifting system, the side benefit is the freedom and creativity afforded frame makers with respect to cable routing,” explained Devin Walton, Director of Media Relations for Shimano North America. 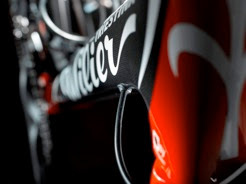 “Wilier’s new frame design takes advantage of that benefit and with the special accommodations for the battery pack creates historically sought-after integration of frame and controls without any impact on shifting response. 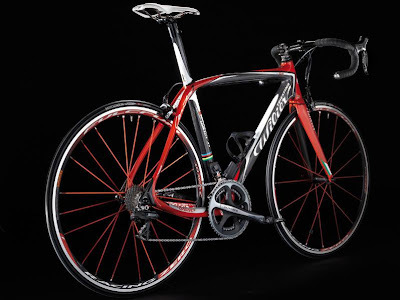 Angelo Cilli, Wilier Triestina USA co-owner and founder, added: “We’re excited about the promising new age being ushered in by Shimano’s electronic groupsets for road and time trial bikes. In the past, attempts were made by other manufacturers to offer electronic shifting, but after extensive in-house testing we have become believers that this technology by Shimano has been refined to the point of being truly feasible and relevant. Campagnolo is promising release of its own electronic drivetrain in the near future, so it seems that the technology may finally be here to stay,” concluded Cilli. We are getting ahead of ourselves by two years....but, the Giro in 2011 will be a special one as well, celebrating the 150th anniversary of the unification of Italy. Planning for a special Giro that year has already begun. Photo: Process of Italian Unification, captioned: Until 1860 present-day Italy was composed of several small states and territories. In 1860 almost all of the states in northern Italy became part of the Kingdom of Sardinia. In 1861 the Kingdom of Sardinia was joined by all the southern states except Rome and became the Kingdom of Italy. In 1871 Rome joined the now-united Italy and became its capital. 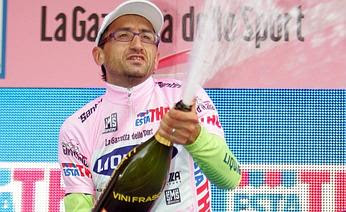 When Liquigas announced that Andrea Noè would not be on their Giro d'Italia squad the news was expected to be "non-notizia" (non-news). However, there has been a backlash from the tifosi all across Italy which are calling upon Liquigas to include Noè in the 100th anniversary Giro. Why? Andrea Noè is the oldest, at 40 years 3 months old, active Italian professional rider. 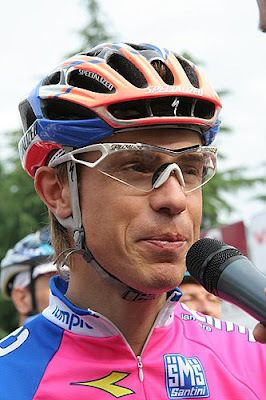 He is also the active rider to have worn the pink jersey the most years in the past having taken a stage and the pink jersey in 1998 (and by the way, also wearing the pink jersey for two days in 2007). 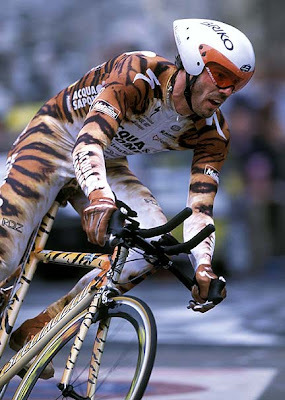 Having started racing in 1993 he was racing then against Argentin and Fondriest. A domestique for Rominger and Olano, Tonkov and Bartoli, Bettini and Di Luca. 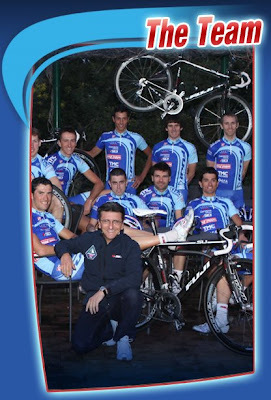 On Mapei, Asics, Mapei-Quick Step, Alessio, and since 2005 with Liquigas. Fifteen Giro di Italia's in sixteen years. Noè has remained fit and competitive as he dreamed to race in the Giro del Centenario and now his non-selection has created a drumbeat for his re-instatement. Mapei's sponsor, Giorgio Squinzi, said it best, "To exclude him shows a lack of understanding of certain values." 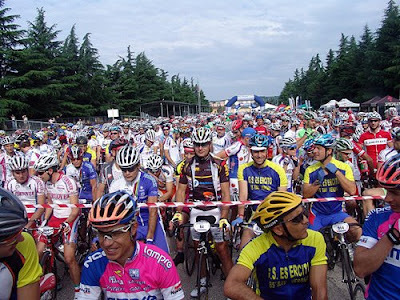 The Gran Fondo Damiano Cunego is scheduled for June 7, 2009, the race starts in Verona . With Cunego, the “Piccolo Principe”, always present it has become a very popular gran fondo, last year surpassing 3,000 riders in its 3rd edition. This year is also the 10th anniversary of Cunego's World Championship Juniors' victory (on a Fontana bike by the way) that took place in Verona in 1999. Each participant in this year's gran fondo will receive a commemorative medallion celebrating that historic victory. -Granfondo: 150 km, 3,518 meters of climbing; the climbs include Erbezzo, Boscochiesanuova, Campofontana, SS Trinità and San Rocco. -Mediofondo: 90 km, 1.740 meters of climbing; in Velo the route descends towards Roveré thereby avoiding the climbs of Campofontana and SS Trinità. -Fondo “Giulietta&Romeo”: 60 km, 960 meters of climbing and passing through Cerro Veronese, Cunego's home town. 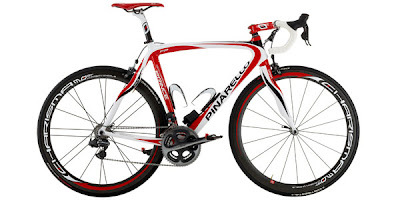 Pinarello announced the introduction of the Prince Di2 showcasing the new Shimano Dura Ace Di2 electronic gruppo. Interestingly, Shimano has actually made available several versions of this gruppo; including the one Pinarello has chosen for the Prince Di2, the OEM Di2 version, which features internal routing of the actuation cables for the electronic componentry. "This Prince was designed by Pinarello's engineers in conjunction with Shimano to eliminate unsightly wiring and the accompanying fasteners. 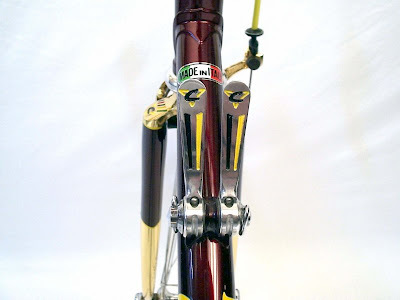 The cables from the levers follow the brake cables under the MOst Talon bar and enter the downtube a short distance from the headtube. This area has been reinforced and features a sealed cover to keep the elements out of the frame. 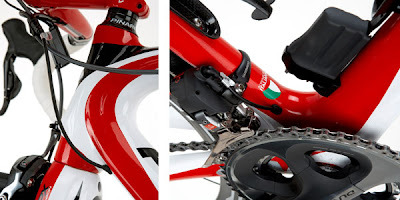 The battery is located below the water bottle cage on the downtube and is attached at an additional boss below the cage and the lower bottle boss. The actuation cables enter and exit the battery pack through another sealed port in the frame and emerge near both the front and rear derailleurs. This creates a very clean line for the cables while keeping the weight of the battery pack as low as possible without the risk of interference with the drivetrain. Everywhere the wiring enters or exits the frame is sealed against the elements and reinforced internally for additional strength. The geometry and ride characteristics of the Prince Di2 are identical to the Prince FP framesets designed for traditional componentry. The Shimano Dura Ace Di2 electronic gruppo has been thoroughly tested by Pinarello over the last few months and determined to be of outstanding quality and reliability. Once you have ridden this gruppo, you will be amazed at how quickly it shifts and how much effort it really takes to shift a mechanical system. Shimano has designed the system to be able to compensate for maladjustments with an on-board calibration system. The control box, which is conveniently located, but out of the way, under the handlebars on the brake cable shows battery life left as well as the means to recalibrate the system should the need arise. The range of the system is easily 1000+ miles between charges and, in the unlikely event of the battery running low; you will get plenty of warning (and shifts) as the front derailleur will quit shifting approximately 50 shifts before the rear derailleur. This should easily be enough to conclude nearly any ride without being stuck in the wrong gear. 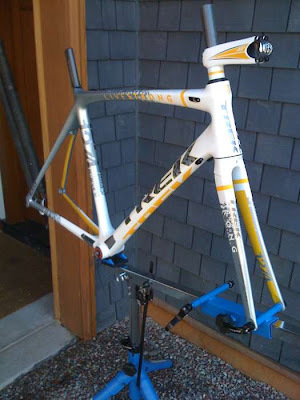 In the event of a crash, the wiring is protected inside the frame to avoid damage." MSRP: $15,900.00...or translated into Italian, "Mamma mia!" These fabulous photographs are from Jered Gruber, Assistant Editor of PezCyclingNews.com. 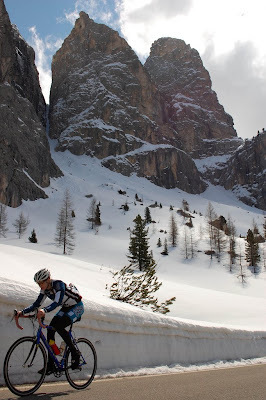 He was on a ride of the "Sella Ronda" on April 24th. 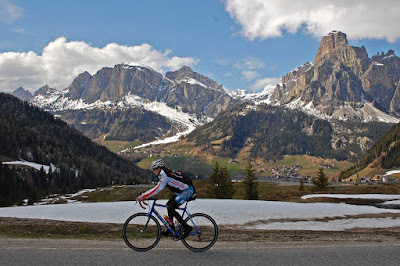 By the way, "Sella Ronda Bike Day" is July 12th this year, the 55-70 km loop (ed. note: distance corrected after investigation based on comment by Sprocketboy) will be closed for motorized traffic and will be accessible only for cyclists. 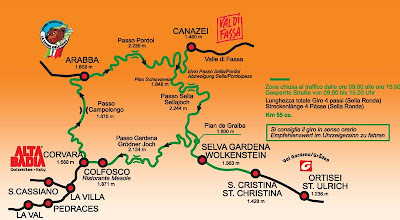 You can start from the valley you prefer: Alta Badia, Val Gardena, Val di Fassa or Arabba. I personally like Corvara so I would start there. In Part I (http://italiancyclingjournal.blogspot.com/2009/04/made-in-italy-or-not.html) we got into the subject of "transformation", in which a product isn't made in Italy but can be transformed to an extent that it meets the criteria for being labeled as being MADE IN ITALY. Thanks to some readers we have additional insights but still not the full story. Until I read this it hadn't occurred to me that a product made in Asia, that underwent their last, substantial, economically justified processing or working in Italy would have the added benefit that it could also now be sold through the EU without customs duties in the EU markets. So not only is there an economic benefit to manufacturing where labor is cheaper but the ability to sell the product in Europe isn't hampered. Unanswered for the moment are questions such as, What constitutes substantial? Economically justified? Representing an important stage of manufacture? Next I was directed to a fairly recent EU case involving televisions (http://eur-lex.europa.eu/LexUriServ/LexUriServ.do?uri=CELEX:62005J0447:EN:HTML.) In Item 6 there is a reference to Annex 11 to Regulation No 2454/93. 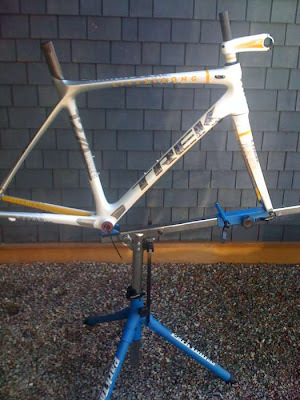 It would appear that different product types have their own "CN code", "Product description", and "Working or processing carried out on non‑originating materials that confers the status of originating products"
What specific values apply to bikes remains to be determined.....a story for another day hopefully. 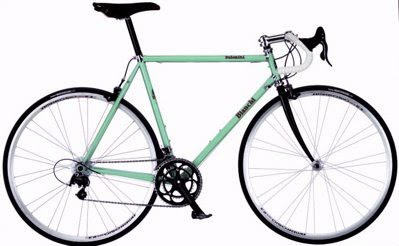 Bianchi Dolomiti, Made In Italy, etc. Fairly quickly the comments in the cycling forums were that it looked like the Asian made Kona "Kapu" (http://www.konaworld.com/09_kapu_en.cfm). Tomorrow, more information on the EU regulations regarding transformation and an example of how complicated the rules are. Mario Cipollini has announced that he will be launching a new line of cycling clothes featuring the most technically advanced fabrics and innovative designs. The line will be named "Cipollini". How far "out of the box" will Mario be thinking in terms of design? Stay tuned! Getting down the mountain one has just climbed is half the fun of climbing it — if one goes about it the proper way, that is. Are you white-knuckled after the first turn? If so, then read on... Are you fearless, but find yourself leaving skin on the mountain a little too often? If so, then read on carefully! The roads in Europe are fantastic, fabulous in the most literal sense; they are very well engineered (better than most in the Americas), and getting down them can really heighten the experience of a Euro cycling trip. That said, there are certain rules of descending that act in accord with the laws of physics, and are therefore best well respected. Follow these simple rules, and learn to employ them—cautiously at first!—and you'll increase your speed and fun factor considerably. This sounds simple enough, but most people get into trouble by ignoring this obvious caveat. There are many things that can distract on a descent: e.g., potholes, other riders, splendid vistas, cute animals, a fast approaching concrete barrier, etc. The key is to look where you want to go, and nowhere else. Of course, if something unanticipated arises, you may need to adjust where you want to go, but the rule holds and is worth restating: always, always look ahead and look where you want to go. When you begin a steep or twisty descent, it's best to be in the drops (even if you otherwise never use that part of your handlebar). Your center of gravity is lower, your back is (for the most part) flatter, and your steering is more controlled. The safest, most reliable position is in the drops. Some like to remain upright out of habit. It's best to train oneself to use the drops when going down hill. Some like to get super aero on the tops, nose skimming the front tire and all, but this is dangerous (for the practitioner and those around him/her). Good tuck in the drops allows for a lower center of gravity, and wider purchase for greater leverage in crosswinds and through corners, and better access to the brakes for speed control. a) Where descending is concerned, brakes are meant to slow you, not stop. As such, your brakes should be adjusted to the size of your hands. If your brakes are set up to engage from the moment you pull the lever in, your hands will tire quickly, and the rest of the way down the mountain will be no fun. You should be able to "cover the brakes", keeping them partially engaged but with little or no pad/rim contact until your fingers are partially bent, thereby allowing greater use of hand strength. b) Control your speed (note: this is a preemptive idea [see "Cornering" below]). c) Use the rear brake more than the front. Both should be used, but keep in mind the front has much more slowing power than the rear. When you slow too quickly, your weight is thrust forward, and your center of gravity changes unpredictably (esp. on steep hills). Feather the front brake and keep the rear from skidding. 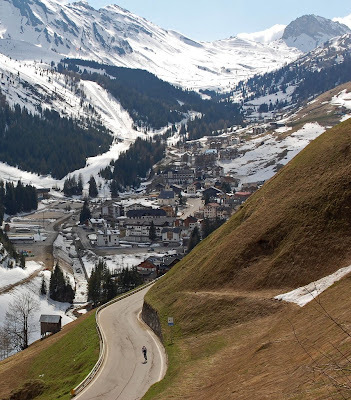 This is, of course, the best and the worst part of descending, depending on your perspective. a) See Rule 1 above: Look ahead! You must control your speed before entering the turn, so as to limit any emergency braking. 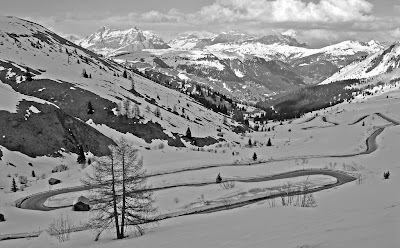 Therefore, as you approach the turn (be it a sweeper or a switchback) you should slow to a speed to which you feel certain you can negotiate the corner. So look ahead, and control speed. 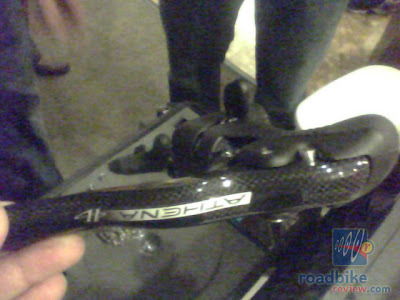 b) Be sure that your outside pedal is down, and that your weight is planted firmly on that pedal (more on this below). c) Always, always, always look to the inside apex of the turn, whether it be the centerline, the shoulder, or some imaginary line. This is because the G forces will always pull you to the outside of the turn, so keeping your eye on the inside will help you stay on course. d) Enter the turn a little wide, and then cut it in tight and hold it as tight as possible (tighter is usually better, as the Gs will pull you out anyway), and then exit the turn as tightly as you can given your speed. e) Once you have entered the turn, you should practice letting off the brakes. This is a tough skill to master, but it works wonders. If you do need to use your brakes, you should feather the front, and apply the rear with moderation, lest the rear wheel skid and slide sideways. The front deserves special attention. (Think about this: if you grab a fist full of front brake, the body continues to move forward as the bike slows, and this sudden change in weight distribution sets up all sorts of undesirable scenarios. Also, when the rotation of the steering [i.e., front] wheel slows suddenly, traction changes, too, and rather unpredictably at that.) So, just as in a car, you should brake before the turn, let the wheels roll through the turn, and then accelerate out of the turn, carrying speed until the next set-up. f) When in doubt, lean it more. 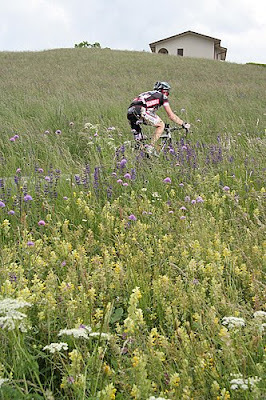 A bicycle can lean much farther than an untrained rider will generally let it lean. If you find yourself in a little trouble (which you shouldn't because you've been controlling your speed, right?! ), it's far better to lean it, than to hit the brakes and bail out. "Bailing" (refusing/failing to commit 100%) in a turn does a number of bad things; most importantly, it can send you into oncoming traffic, and/or cause you to straighten up suddenly, thereby throwing your weight forward and off center (think of yourself as though you're a plumb-line on your bike, and your weight stays more or less anchored), and when one's weight is thrown off the likelihood of "high-siding" is increased tenfold. To commit 100% to your turn you may have to employ "counter-steering" technique, which is accomplished by pushing on the inside of the handlebar as you simultaneously weight the outside pedal (see above), keeping the knees braced inward. This takes practice, and should be tried incrementally, not all at once at high speeds. Once this technique is mastered, however, it is very, very difficult to crash, because you're using the laws of physics in your interests, not simply charging downhill and hoping for the best. g) Finally, when it's wet, respect the roads! European roads can be very slick when wet. I have now updated the list of cycling museums in Italy with the addition of information about Museo Nicolis and the Coppi Home at Castellania. Please see http://italiancyclingjournal.blogspot.com/2009/03/cycling-museums-in-italy.html for the complete list and information. Rebellin was wearing a helmet hand painted by Cornelio Perini who came up with the design to promote the UNICO1 organization(http://www.unico1.org/). Rebellin is one of the leaders of this organization which has been formed to help seriously ill babies. Get your entries in soon! The contest is open until May 28th. 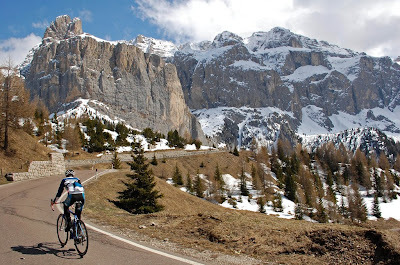 The two top prizes are board, lodging and registration for the Maratona dles Dolomites from the 3rd to 5th of July. 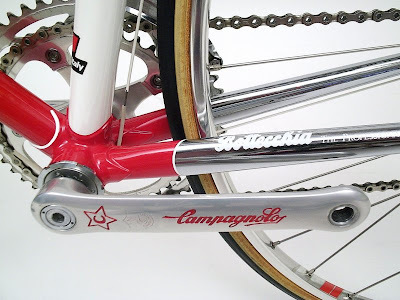 And, you'll be part of the "C11 Campagnolo Dream Team". 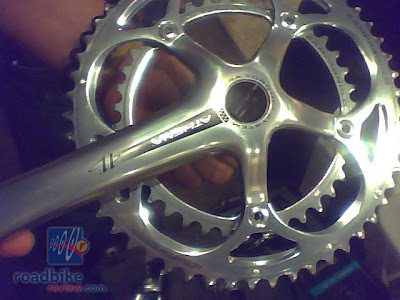 The contest requires having purchased an 11 speed gruppo or Sportswear 11 Speed set (jersey + bib shorts). 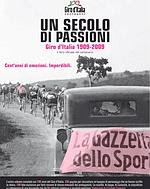 Book: "Un Secolo Di Passioni"
The official Giro d'Italia's 100th anniversary book, covering 1909 up to the 2009 race, began being sold today in bookstores in Italy. There has been a slight name change from the original announcements. The book is now entitled "Un Secolo Di Passioni" (A Century Of Passion); the original announcements referred to the title as "100 Anni Di Passioni" (100 Years of Passion). Written by Pier Bergonzi and Elio Trifari the large format book has 256 pages and 289 photographs from the archives of the Gazzetta dello Sport. Published by Rizzoli Libri the cost is 14.99 euro. FUJI-SERVETTO has been awarded the last, 22nd, spot today in the 100th Giro d'Italia. The FUJI-SERVETTO team was established in late-2008, having formally registered by the International Cycling Union in November 26th. MADE IN ITALY, or NOT? 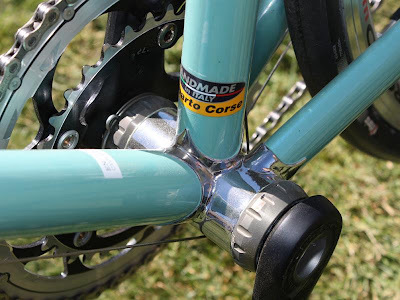 I've become very disenchanted with the current situation regarding the fudging, and in some cases, deceit about the use of "MADE IN ITALY" when it comes to bikes. 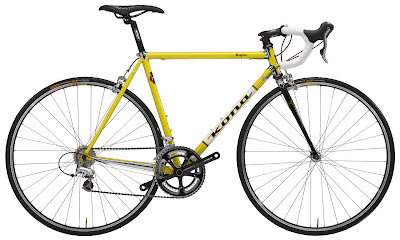 As mostly everyone has come to learn many bikes are now made in Asia and labeled as MADE IN ITALY, or through omission you believe they are made in Italy. My issue isn't one of the quality of Asian made vs. Italian made bikes, I just fall into the category of people that believes if a bike has "MADE IN ITALY" it should be made there. a)"I think European Union legislation states that they have to say "Made in Europe" ... furthermore if a product has some extra work done on it in Europe which increases its value by 60% it could be stated that its made in Europe - so a frame could be made in China for say 500 dollars and then painted, labeled, boxed etc for 300 dollars so that the finished product will have a cost price of 800 dollars and then sold as made in Europe for 1600 dollars." b) "There is something to that effect, but I believe that the 60% is of the total value, not the added value, so if the frame sells for $500, if $300 is created in Europe, it can be labeled as made in Italy. That is my understanding but I am not sure. So effectively the value added component must be 150% of the imported content. All of this is however hearsay and not necessarily the case." If any readers know of these "transformation" rules please leave a comment or contact me. 4. there is also of category frames that are Asian made for a strong Italian brand(s) that although there is no MADE IN ITALY you are decidedly left withe the impression that it's made in Italy. Super Mario is now the "performance manager" of the ISD squad, one of the invited teams to the Giro d'Italia. This past week he has been riding with the team, all using their time trial bikes, on the roads between Lucca and Pisa in preparation for Venice. The time trail team make-up is likely to be: Giovanni Visconti (team captain), experienced riders Dario David Cioni and Leonardo Scarselli; specialist Andrey Grivko, Dmitry Grabovskyy, and Bartosz Huzarski; Ukranian champion Ruslan Pidgornyy and Italian sprinter Oscar Gatto. Of the training Cipollini said, "We are satisfied with the testing we performed, now we await Venice. We could be the true surprise." 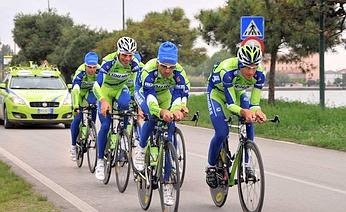 Ivan Basso is in Venice training for the time trial. 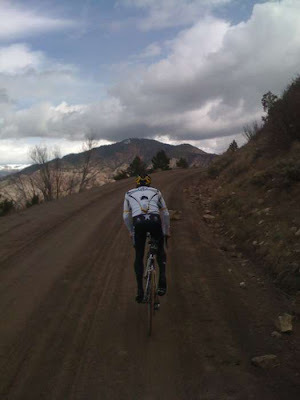 Lance Armstrong is near Aspen, Colorado, training on dirt roads, and has a new bike being prepared; he says his collarbone feels good even on the dirt roads. 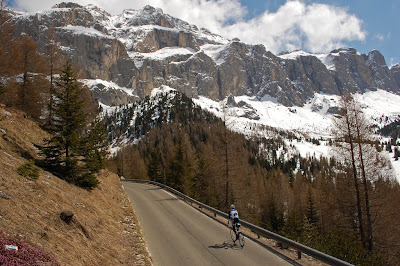 18 days, 16 hours to the Giro! The Gazzetta dello Sport has described Ivan Basso's preparations for the Giro d'Italia as "maniacal". He has explored virtually every stage, most recently riding the time trial course with Liquigas teammates on the Lido in Venice. 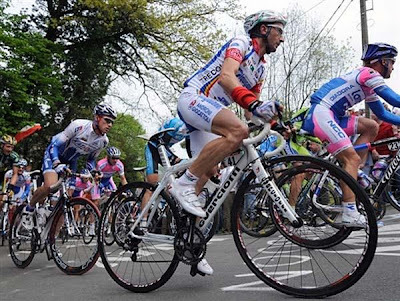 They rode the course three times of which Basso said, "My impression is a very positive one. The circuit appeals a lot to me, and in this setting it will be uniquely spectacular. It will be a very high velocity test." For for details, and aerial photos, of the opening time trial stage in Venice on May 9th see: http://italiancyclingjournal.blogspot.com/2009/01/100-days-to-start-of-giro-ditalia-in.html. By the way, the time trial will begin at approximately 3:00pm local, and the last squad is expected to finish at approximately 5:10pm local. For the celebration of the 100th anniversary of the Giro d'Italia, cycling club ASD 1001 MI.SAV in collaboration with A.R.I. 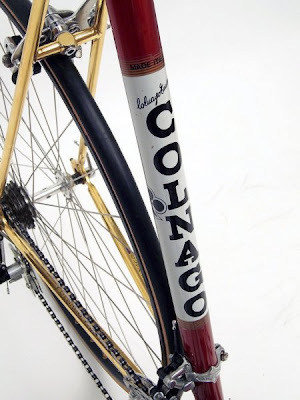 (Audax Randonneur Italia) is organizing a replica (in parts) of the first stage of the 1909 Giro d'Italia on May 17th. The number of participants in the randonnèe are limited to the number of 1909: 127. The start time will be the same: 2:53 a.m., and the start location will be the same: Piazza Loreto (Milano). The route will take riders through the provinces of Milano, Como, and Varese and will be 168 km in length with 1045 meters of elevation gain. 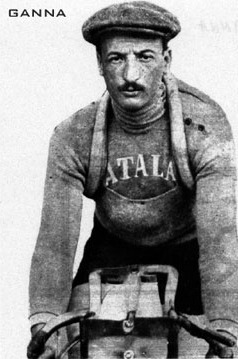 The control, and rest stop, will be in Induno Olona, the birthplace of Luigi Ganna, winner of the 1909 Giro d'Italia. Campagnolo is re-introducing the Athena gruppo. It will be become the lowest price point entry into Campagnolo's 11 speed offerings (currently Chorus, Record and Super Record). The gruppo is rumored to be entirely in silver alloy with the exception of the brake levers. 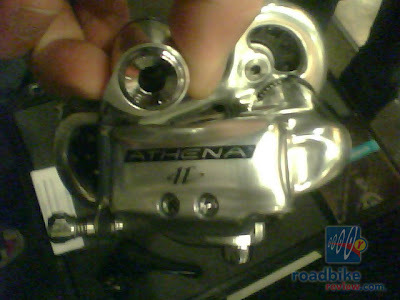 The brake levers are supposedly Centaur, silver alloy, levers wrapped in carbon so there is hope that Campagnolo may offer an option for silver alloy Athena levers. 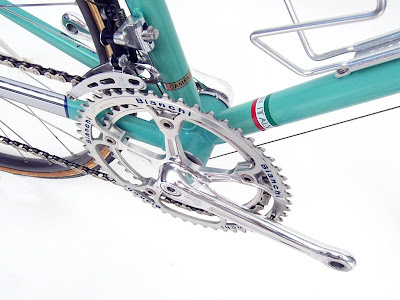 It would be nice to see an all silver, 11 speed, gruppo on the market for those that prefer Campagnolo in the more classic look. Athena availability is planned for Fall of this year. 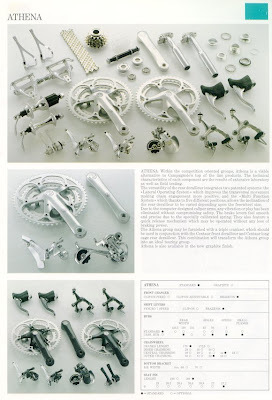 Athena first appeared in the 1991 Campagnolo catalog and then eventually disappeared. Note: reader Michele commented that Athena first appeared in 1988. Grazie. Like to Climb? How About 50,600 Feet in 6 Days? 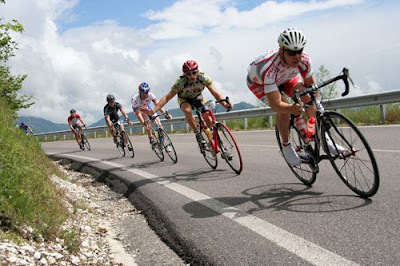 Granfondo Gianni Motta "Citta' di Vicenza"